Delta was also named Fortune's Most Admired Airline, rated No. 1 on the industry list for the eighth time in the past nine years. The Fortune list is a ranking of the world's most respected and reputable companies, as ranked by their corporate peers. Delta CEO Ed Bastian credited the award to the dedication of the airline's 80,000-person workforce. "This recognition is an extraordinary accomplishment, and it is the direct result of your dedication, hard work and passion for serving our customers and each other," he wrote in a memo to all employees. "Together we are achieving results that have never before been seen in our industry. And the world is taking notice." Each year, Fortune surveys executives and directors across all industries to rank the companies they most admire in nine areas such as innovation, people management and financial soundness, as well as an overall reputation. Fortune editors compile the data and publish a list of the Most Admired Companies. Delta is ranked No. 28 this year – its highest-ever overall ranking. 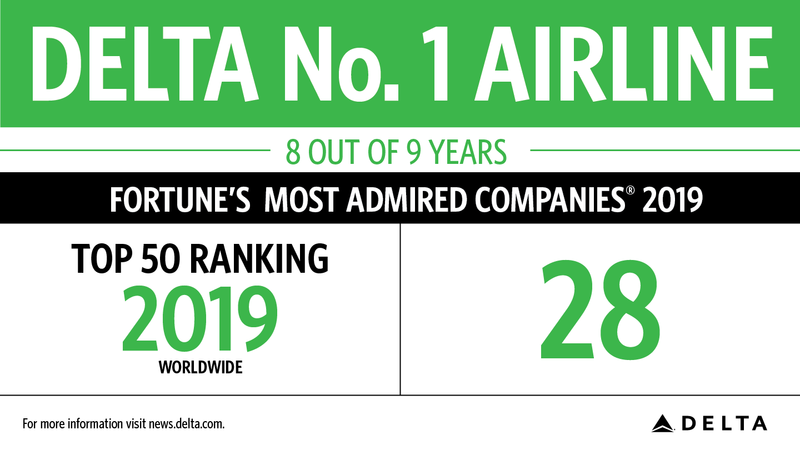 Most Admired Companies is just the latest accolade for Delta. The airline was recently named the Wall Street Journal's top U.S. airline for the second consecutive year, 2018's Most On-Time International Mainline Airline, a Fortune Magazine 100 Best Companies to Work For, a Fast Company "Most Innovative Company" and more.